For other uses, see Columbia University (disambiguation). Columbia University (Columbia; officially Columbia University in the City of New York), established in 1754, is a private Ivy League research university in Upper Manhattan, New York City. Columbia contains the oldest college in the state of New York and is the fifth chartered institution of higher learning in the United States, making it one of nine colonial colleges founded prior to the Declaration of Independence. It was established as King's College by royal charter of George II of Great Britain and renamed Columbia College in 1784 following the American Revolutionary War. The university has produced numerous distinguished alumni. In 2017, its undergraduate acceptance rate was 5.5%, making it the third most selective college in the United States and the second most selective in the Ivy League. A 1787 charter placed the institution under a private board of trustees before it was renamed Columbia University in 1896, when the campus was moved from Madison Avenue to its location in Morningside Heights. Columbia is one of the fourteen founding members of the Association of American Universities and was the first school in the United States to grant the M.D. degree. The university administers the Pulitzer Prize annually. Columbia is organized into twenty schools, including many undergraduate and graduate schools. Its affiliates outside of the US are known as Columbia Global Centers. In athletics, the Lions field varsity teams in 29 sports as a member of the NCAA Division I Ivy League conference. The university's endowment stood at $10 billion in 2018, making it one of the largest of any academic institution. The university has graduated many notable alumni, including five Founding Fathers of the United States, an author of the United States Constitution and a member of the Committee of Five. As of 2018, Columbia's Alumni include three U.S. presidents, 29 foreign heads of state, 10 Justices of the United States Supreme Court, 95 Nobel laureates, 101 National Academy members, and 38 living billionaires. In addition, Columbia students and alumni have won 39 Academy Awards, 125 Pulitzer Prizes, and 11 Olympic medals. Discussions regarding the founding of a college in the Province of New York began as early as 1704, at which time Colonel Lewis Morris wrote to the Society for the Propagation of the Gospel in Foreign Parts, the missionary arm of the Church of England, persuading the society that New York City was an ideal community in which to establish a college. However, it was not until the founding of the College of New Jersey (the present Princeton University) across the Hudson River in New Jersey that the City of New York seriously consider founding a college. In 1746, an act was passed by the general assembly of New York to raise funds for the foundation of a new college. In 1751, the assembly appointed a commission of ten New York residents, seven of whom were members of the Church of England, to direct the funds accrued by the state lottery towards the foundation of a college. In 1763, Dr. Johnson was succeeded in the presidency by Myles Cooper, a graduate of The Queen's College, Oxford, and an ardent Tory. In the charged political climate of the American Revolution, his chief opponent in discussions at the college was an undergraduate of the class of 1777, Alexander Hamilton. The American Revolutionary War broke out in 1776, and was catastrophic for the operation of King's College, which suspended instruction for eight years beginning in 1776 with the arrival of the Continental Army. The suspension continued through the military occupation of New York City by British troops until their departure in 1783. The college's library was looted and its sole building requisitioned for use as a military hospital first by American and then British forces. Loyalists were forced to abandon their King's College in New York, which was seized by the rebels and renamed Columbia College. The Loyalists, led by Bishop Charles Inglis fled to Windsor, Nova Scotia, where they founded King's Collegiate School. After the Revolution, the college turned to the State of New York in order to restore its vitality, promising to make whatever changes to the school's charter the state might demand. The Legislature agreed to assist the college, and on May 1, 1784, it passed "an Act for granting certain privileges to the College heretofore called King's College". The Act created a Board of Regents to oversee the resuscitation of King's College, and, in an effort to demonstrate its support for the new Republic, the Legislature stipulated that "the College within the City of New York heretofore called King's College be forever hereafter called and known by the name of Columbia College", a reference to Columbia, an alternative name for America. The Regents finally became aware of the college's defective constitution in February 1787 and appointed a revision committee, which was headed by John Jay and Alexander Hamilton. In April of that same year, a new charter was adopted for the college granted the power to a private board of 24 Trustees. On May 21, 1787, William Samuel Johnson, the son of Dr. Samuel Johnson, was unanimously elected President of Columbia College. Prior to serving at the university, Johnson had participated in the First Continental Congress and been chosen as a delegate to the Constitutional Convention. For a period in the 1790s, with New York City as the federal and state capital and the country under successive Federalist governments, a revived Columbia thrived under the auspices of Federalists such as Hamilton and Jay. Both President George Washington and Vice President John Adams attended the college's commencement on May 6, 1789, as a tribute of honor to the many alumni of the school who had been involved in the American Revolution. In November 1813, the College agreed to incorporate its medical school with The College of Physicians and Surgeons, a new school created by the Regents of New York, forming Columbia University College of Physicians and Surgeons. The college's enrollment, structure, and academics stagnated for the majority of the 19th century, with many of the college presidents doing little to change the way that the college functioned. In 1857, the college moved from the King's College campus at Park Place to a primarily Gothic Revival campus on 49th Street and Madison Avenue, where it remained for the next forty years. During the last half of the 19th century, under the leadership of President F.A.P. Barnard, the president Barnard College is named after, the institution rapidly assumed the shape of a modern university. Barnard College was created in 1889 as a response to the university's refusal to accept women. By this time, the college's investments in New York real estate became a primary source of steady income for the school, mainly owing to the city's expanding population. University president Seth Low moved the campus from 49th Street to its present location, a more spacious campus in the developing neighborhood of Morningside Heights. Under the leadership of Low's successor, Nicholas Murray Butler, who served for over four decades, Columbia rapidly became the nation's major institution for research, setting the "multiversity" model that later universities would adopt. Prior to becoming the president of Columbia University, Butler founded Teachers College, as a school to prepare home economists and manual art teachers for the children of the poor, with philanthropist Grace Hoadley Dodge. Teachers College came under the aegis of Columbia University in 1893 and is currently affiliated as the university's Graduate School of Education. Research into the atom by faculty members John R. Dunning, I. I. Rabi, Enrico Fermi and Polykarp Kusch placed Columbia's Physics Department in the international spotlight in the 1940s after the first nuclear pile was built to start what became the Manhattan Project. In 1928, Seth Low Junior College was established by Columbia University in order to mitigate the number of Jewish applicants to Columbia College. The college was closed in 1938 due to the adverse effects of the Great Depression and its students were subsequently absorbed into University Extension. In 1947, the program was reorganized as an undergraduate college and designated the School of General Studies in response to the return of GIs after World War II. In 1995, the School of General Studies was again reorganized as a full-fledged liberal arts college for non-traditional students (those who have had an academic break of one year or more, or are pursuing dual-degrees) and was fully integrated into Columbia's traditional undergraduate curriculum. Within the same year, the Division of Special Programs—later the School of Continuing Education, and now the School of Professional Studies—was established to reprise the former role of University Extension. While the School of Professional Studies only offered non-degree programs for lifelong learners and high school students in its earliest stages, it now offers degree programs in a diverse range of professional and inter-disciplinary fields. In the aftermath of World War II, the discipline of international relations became a major scholarly focus of the University, and in response, the School of International and Public Affairs was founded in 1946, drawing upon the resources of the faculties of political science, economics, and history. During the 1960s Columbia experienced large-scale student activism, which reached a climax in the spring of 1968 when hundreds of students occupied buildings on campus. The incident forced the resignation of Columbia's President, Grayson Kirk and the establishment of the University Senate. Though several schools within the university had admitted women for years, Columbia College first admitted women in the fall of 1983, after a decade of failed negotiations with Barnard College, the all-female institution affiliated with the university, to merge the two schools. 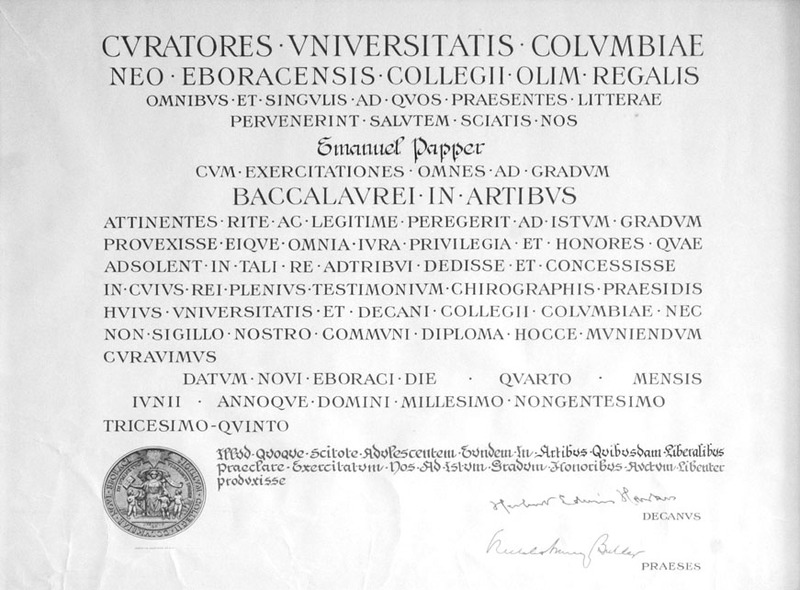 Barnard College still remains affiliated with Columbia, and all Barnard graduates are issued diplomas authorized by both Columbia University and Barnard College. During the late 20th century, the University underwent significant academic, structural, and administrative changes as it developed into a major research university. For much of the 19th century, the University consisted of decentralized and separate faculties specializing in Political Science, Philosophy, and Pure Science. In 1979, these faculties were merged into the Graduate School of Arts and Sciences. In 1991, the faculties of Columbia College, the School of General Studies, the Graduate School of Arts and Sciences, the School of the Arts, and the School of Professional Studies were merged into the Faculty of Arts and Sciences, leading to the academic integration and centralized governance of these schools. In 2010, the School of International and Public Affairs, which was previously a part of the Faculty of Arts and Sciences, became an independent faculty. According to New York, Columbia University is the second largest landowner in New York City, after the Catholic Church. The majority of Columbia's graduate and undergraduate studies are conducted in Morningside Heights on Seth Low's late-19th century vision of a university campus where all disciplines could be taught at one location. The campus was designed along Beaux-Arts principles by architects McKim, Mead, and White. Columbia's main campus occupies more than six city blocks, or 32 acres (13 ha), in Morningside Heights, New York City, a neighborhood that contains a number of academic institutions. The university owns over 7,800 apartments in Morningside Heights, housing faculty, graduate students, and staff. Almost two dozen undergraduate dormitories (purpose-built or converted) are located on campus or in Morningside Heights. Columbia University has an extensive underground tunnel system more than a century old, with the oldest portions predating the present campus. Some of these remain accessible to the public, while others have been cordoned off. The Nicholas Murray Butler Library, known simply as Butler Library, is the largest single library in the Columbia University Library System, and is one of the largest buildings on the campus. Proposed as "South Hall" by the university's former President Nicholas Murray Butler as expansion plans for Low Memorial Library stalled, the new library was funded by Edward Harkness, benefactor of Yale's residential college system, and designed by his favorite architect, James Gamble Rogers. It was completed in 1934 and renamed for Butler in 1946. The library design is neo-classical in style. Its facade features a row of columns in the Ionic order above which are inscribed the names of great writers, philosophers, and thinkers, most of whom are read by students engaged in the Core Curriculum of Columbia College. As of 2012, Columbia's library system includes over 11.9 million volumes, making it the eighth largest library system and fifth largest collegiate library system in the United States. "The Steps", alternatively known as "Low Steps" or the "Urban Beach", are a popular meeting area for Columbia students. The term refers to the long series of granite steps leading from the lower part of campus (South Field) to its upper terrace. With a design inspired by the City Beautiful movement, the steps of Low Library provides Columbia University and Barnard College students, faculty, and staff with a comfortable outdoor platform and space for informal gatherings, events, and ceremonies. McKim's classical facade epitomizes late 19th century new-classical designs, with its columns and portico marking the entrance to an important structure. On warm days when the weather is favorable, the Low Steps often become a popular gathering place for students to sunbathe, eat lunch, or play frisbee. In April 2007, the university purchased more than two-thirds of a 17 acres (6.9 ha) site for a new campus in Manhattanville, an industrial neighborhood to the north of the Morningside Heights campus. Stretching from 125th Street to 133rd Street, the new campus will house buildings for Columbia's Business School, School of International and Public Affairs, and the Jerome L. Greene Center for Mind, Brain, and Behavior, where research will occur on neurodegenerative diseases such as Parkinson's and Alzheimer's. The $7 billion expansion plan includes demolishing all buildings, except three that are historically significant, eliminating the existing light industry and storage warehouses, and relocating tenants in 132 apartments. Replacing these buildings will be 6,800,000 square feet (630,000 m2) of space for the university. Community activist groups in West Harlem fought the expansion for reasons ranging from property protection and fair exchange for land, to residents' rights. Subsequent public hearings drew neighborhood opposition. As of December 2008, the State of New York's Empire State Development Corporation approved use of eminent domain, which, through declaration of Manhattanville's "blighted" status, gives governmental bodies the right to appropriate private property for public use. On May 20, 2009, the New York State Public Authorities Control Board approved the Manhanttanville expansion plan and the first buildings are under construction. New York-Presbyterian Hospital is affiliated with the medical schools of both Columbia University and Cornell University. According to U.S. News & World Report's "America's Best Hospitals 2009", it is ranked sixth overall and third among university hospitals. Columbia's medical school has a strategic partnership with New York State Psychiatric Institute, and is affiliated with 19 other hospitals in the U.S. and four hospitals overseas. Health-related schools are located at the Columbia University Medical Center, a 20 acres (8.1 ha) campus located in the neighborhood of Washington Heights, fifty blocks uptown. Other teaching hospitals affiliated with Columbia through the New York-Presbyterian network include the Payne Whitney Clinic in Manhattan, and the Payne Whitney Westchester, a psychiatric institute located in White Plains, New York. On the northern tip of Manhattan island (in the neighborhood of Inwood), Columbia owns 26-acre (11 ha) Baker Field, which includes the Lawrence A. Wien Stadium as well as facilities for field sports, outdoor track, and tennis. There is a third campus on the west bank of the Hudson River, the 157-acre (64 ha) Lamont-Doherty Earth Observatory and Earth Institute in Palisades, New York. A fourth is the 60-acre (24 ha) Nevis Laboratories in Irvington, New York for the study of particle and motion physics. A satellite site in Paris, France holds classes at Reid Hall. Columbia University received 36,292 applications for its undergraduate class of 2020 (entering 2016). In early decision, 620 out of 3,520 applicants were admitted, for an acceptance rate of 17.61%. In regular decision, 1,573 out of 32,772 applicants were admitted, for an acceptance rate of 4.79%. For the Class of 2021, 2,185 out of 37,389 applicants were admitted for an overall acceptance rate of 5.8%, making Columbia the third most selective college in the United States behind Stanford and Harvard and the second most selective college in the Ivy League. The acceptance rate for the class of 2022 was 5.5%, with the University accepting 2,214 out of 40,203 applicants. According to the 2012 college selectivity ranking by U.S. News & World Report, which factors admission and yield rates among other criteria, Columbia was tied with Yale, Caltech and MIT as the most selective colleges in the country. Columbia is a racially diverse school, with approximately 52% of all students identifying themselves as persons of color. Additionally, 50% of all undergraduates received grants from Columbia. The average grant size awarded to these students is $46,516. In 2015–2016, annual undergraduate tuition at Columbia was $50,526 with a total cost of attendance of $65,860 (including room and board). On April 11, 2007, Columbia University announced a $400m to $600m donation from media billionaire alumnus John Kluge to be used exclusively for undergraduate financial aid. The donation is among the largest single gifts to higher education. Its exact value will depend on the eventual value of Kluge's estate at the time of his death; however, the generous donation has helped change financial aid policy at Columbia. Annual gifts, fund-raising, and an increase in spending from the university's endowment have allowed Columbia to extend generous financial aid packages to qualifying students. As of 2008, undergraduates from families with incomes as high as $60,000 a year will have the projected cost of attending the university, including room, board, and academic fees, fully paid for by the university. That same year, the university ended loans for incoming and then-current students who were on financial aid, replacing loans that were traditionally part of aid packages with grants from the university. However, this does not apply to international students, transfer students, visiting students, or students in the School of General Studies. In the fall of 2010, admission to Columbia's undergraduate colleges Columbia College and the Fu Foundation School of Engineering and Applied Science (also known as SEAS or Columbia Engineering) began accepting the Common Application. The policy change made Columbia one of the last major academic institutions and the last Ivy League university to switch to the Common Application. In 1919, Columbia established a student application process characterized by The New York Times as "the first modern college application.". The application required the maiden name of a student's mother, his or her photograph, and the student's religious background. The President of Columbia University, who is selected by the Trustees in consultation with the Executive Committee of the University Senate and who serves at the Trustees' pleasure, is the chief executive officer of the university. Assisting the President in administering the University are the Provost, the Senior Executive Vice President, the Executive Vice President for Health and Biomedical Sciences, several other vice presidents, the General Counsel, the Secretary of the University, and the deans of the Faculties, all of whom are appointed by the Trustees on the nomination of the President and serve at their pleasure. Lee C. Bollinger became the 19th President of Columbia University on June 1, 2002. A prominent advocate of affirmative action, he played a leading role in the twin Supreme Court cases—Grutter v Bollinger and Gratz v Bollinger—that upheld and clarified the importance of diversity as a compelling justification for affirmative action in higher education. A leading First Amendment scholar, he is widely published on freedom of speech and press, and serves on the faculty of Columbia Law School. Columbia has three official undergraduate colleges: Columbia College (CC), the liberal arts college offering the Bachelor of Arts degree, the Fu Foundation School of Engineering and Applied Science (also known as SEAS or Columbia Engineering) is the engineering and applied science school offering the Bachelor of Science degree, and The School of General Studies (GS), the liberal arts college offering the Bachelor of Arts degree to non-traditional students undertaking full- or part-time study. Joint degree programs are available through Union Theological Seminary, the Jewish Theological Seminary of America, as well as through the Juilliard School. Teachers College and Barnard College are faculties of the university; both college's presidents are deans under the University governance structure. The Columbia University Senate includes faculty and student representatives from Teachers College and Barnard College who serve two-year terms; all senators are accorded full voting privileges regarding matters impacting the entire University. Columbia's General Studies school also has joint undergraduate programs available through University College London, Sciences Po, City University of Hong Kong, Trinity College Dublin, and the Juilliard School. The university also has several Columbia Global Centers. in Amman, Beijing, Istanbul, Paris, Mumbai, Rio de Janeiro, Santiago, Asunción and Nairobi. Columbia University was ranked 2nd among U.S. colleges for 2017 by Wall Street Journal and Times Higher Education and 2nd among Ivy League schools. It was ranked 4th overall among U.S. national universities for 2016 by U.S. News & World Report. Individual colleges and schools were also nationally ranked by U.S. News & World Report for its 2016 edition. Columbia Law School was ranked tied for 4th, the Mailman School of Public Health 5th, the School of Social Work 5th, Teachers College 7th, Columbia Business School 8th, the College of Physicians and Surgeons tied for 6th for research (and tied for 51st for primary care), the Graduate School of Arts 6th, the School of Nursing tied for 8th, and the Fu Foundation School of Engineering and Applied Science (graduate) was ranked 13th. In 2017, Columbia was ranked 8th in the world by Academic Ranking of World Universities, 18th in the world by QS World University Rankings, 14th globally by Times Higher Education World University Rankings, and 8th in the world by U.S. News and World Report. Rankings by other organizations include the Graduate School of Architecture, Planning and Preservation #2, and its Graduate School of Journalism #1. Between 1996 and 2008, 18 Columbia affiliates have won Nobel Prizes, of whom nine are faculty members while one is an adjunct senior research scientist (Daniel Tsui) and the other a Global Fellow (Kofi Annan). Columbia faculty awarded the Nobel Prize include Richard Axel, Martin Chalfie, Eric Kandel, Tsung-Dao Lee, Robert Mundell, Orhan Pamuk, Edmund S. Phelps, Joseph Stiglitz, and Horst L. Stormer. Other awards and honors won by faculty include 30 MacArthur Foundation Award winners, 4 National Medal of Science recipients, 43 National Academy of Sciences Award winners, 20 National Academy of Engineering Award winners, 38 Institute of Medicine of the National Academies Award recipients and 143 American Academy of Arts and Sciences Award winners. In 2015, Columbia University was ranked the first in the state by average professor salaries. In 2011, the Mines ParisTech : Professional Ranking World Universities ranked Columbia 3rd best university for forming CEOs in the US and 12th worldwide. Columbia was the first North American site where the uranium atom was split. The College of Physicians and Surgeons played a central role in developing the modern understanding of neuroscience with the publication of Principles of Neural Science, described by historian of science Katja Huenther as the "neuroscience 'bible'". The book was written by a team of Columbia researchers that included Nobel Prize winner Eric Kandel, James H. Schwartz, and Thomas Jessell. Columbia was the birthplace of FM radio and the laser. The MPEG-2 algorithm of transmitting high quality audio and video over limited bandwidth was developed by Dimitris Anastassiou, a Columbia professor of electrical engineering. Biologist Martin Chalfie was the first to introduce the use of Green Fluorescent Protein (GFP) in labeling cells in intact organisms. Other inventions and products related to Columbia include Sequential Lateral Solidification (SLS) technology for making LCDs, System Management Arts (SMARTS), Session Initiation Protocol (SIP) (which is used for audio, video, chat, instant messaging and whiteboarding), pharmacopeia, Macromodel (software for computational chemistry), a new and better recipe for glass concrete, Blue LEDs, and Beamprop (used in photonics). Columbia scientists have been credited with about 175 new inventions in the health sciences each year. More than 30 pharmaceutical products based on discoveries and inventions made at Columbia reached the market. These include Remicade (for arthritis), Reopro (for blood clot complications), Xalatan (for glaucoma), Benefix, Latanoprost (a glaucoma treatment), shoulder prosthesis, homocysteine (testing for cardiovascular disease), and Zolinza (for cancer therapy). Columbia Technology Ventures (formerly Science and Technology Ventures), as of 2008, manages some 600 patents and more than 250 active license agreements. Patent-related deals earned Columbia more than $230 million in the 2006 fiscal year, according to the university, more than any university in the world. Columbia owns many unique research facilities, such as the Columbia Institute for Tele-Information dedicated to telecommunications and the Goddard Institute for Space Studies, which is an astronomical observatory affiliated with NASA. In 2017, Columbia University's student population was 32,429 (8,868 students in undergraduate programs and 23,561 in postgraduate programs), with 42% of the student population identifying themselves as a minority and 28% born outside of the United States. Twenty-six percent of students at Columbia have family incomes below $60,000, making it one of the most socioeconomically diverse top-tier colleges. Sixteen percent of students at Columbia receive Federal Pell Grants, which mostly go to students whose family incomes are below $40,000. Fifteen percent of students are the first member of their family to attend a four-year college. On-campus housing is guaranteed for all four years as an undergraduate. Columbia College and the Fu Foundation School of Engineering and Applied Science (also known as SEAS or Columbia Engineering) share housing in the on-campus residence halls. First-year students usually live in one of the large residence halls situated around South Lawn: Hartley Hall, Wallach Hall (originally Livingston Hall), John Jay Hall, Furnald Hall or Carman Hall. Upperclassmen participate in a room selection process, wherein students can pick to live in a mix of either corridor- or apartment-style housing with their friends. The Columbia University School of General Studies, Barnard College and graduate schools have their own apartment-style housing in the surrounding neighborhood. Columbia University is home to many fraternities, sororities, and co-educational Greek organizations. Approximately 10–15% of undergraduate students are associated with Greek life. Many Barnard women also join Columbia sororities. There has been a Greek presence on campus since the establishment in 1836 of the Delta Chapter of Alpha Delta Phi. The InterGreek Council is the self-governing student organization that provides guidelines and support to its member organizations within each of the three councils at Columbia, the Interfraternity Council, Panhellenic Council, and Multicultural Greek Council. The three council presidents bring their affiliated chapters together once a month to meet as one Greek community. The InterGreek Council meetings provide opportunity for member organizations to learn from each other, work together and advocate for community needs. The Columbia Daily Spectator is the nation's second-oldest student newspaper; and The Blue and White, a monthly literary magazine established in 1890, discusses campus life and local politics in print and on its daily blog, dubbed the Bwog. The Morningside Post is a student-run multimedia news publication. Its content: student-written investigative news, international affairs analysis, opinion, and satire. Columbia is home to numerous undergraduate academic publications. The Journal of Politics & Society, is a journal of undergraduate research in the social sciences, published and distributed nationally by the Helvidius Group; Publius is an undergraduate journal of politics established in 2008 and published biannually; the Columbia East Asia Review allows undergraduates throughout the world to publish original work on China, Japan, Korea, Tibet, and Vietnam and is supported by the Weatherhead East Asian Institute; and The Birch, is an undergraduate journal of Eastern European and Eurasian culture that is the first national student-run journal of its kind; the Columbia Political Review, the undergraduate magazine on politics operated by the Columbia Political Union; the Columbia Economics Review, the undergraduate economic journal on research and policy supported by the Columbia Economics Department; and the Columbia Science Review is a science magazine that prints general interest articles, faculty profiles, and student research papers. Founded in 1961 under the auspices of Columbia University's Graduate School of Journalism, the Columbia Journalism Review (CJR) examines day-to-day press performance as well as the forces that affect that performance. The magazine is published six times a year, and offers a reporting, analysis, criticism, and commentary. CJR.org, its web site, delivers real-time criticism and reporting, giving CJR a presence in the ongoing conversation about the media. Columbia is home to two pioneers in undergraduate campus radio broadcasting, WKCR-FM and CTV. Many undergraduates are also involved with Barnard's radio station, WBAR. WKCR, the student run radio station that broadcasts to the Tri-State area, claims to be the oldest FM radio station in the world, owing to the university's affiliation with Major Edwin Armstrong. The station went operational on July 18, 1939, from a 400-foot antenna tower in Alpine, New Jersey, broadcasting the very first FM transmission in the world. Initially, WKCR wasn't a radio station, but an organization concerned with the technology of radio communications. As membership grew, however, the nascent club turned its efforts to broadcasting. Armstrong helped the students in their early efforts, donating a microphone and turntables when they designed their first makeshift studio in a dorm room. The station has its studios on the second floor of Alfred Lerner Hall on the Morningside campus with its main transmitter tower at 4 Times Square in Midtown Manhattan. Columbia Television (CTV) is the nation's second oldest Student television station and home of CTV News, a weekly live news program produced by undergraduate students. Columbia is a top supplier of young engineering entrepreneurs for New York City. Over the past 20 years, graduates of Columbia established over 100 technology companies. Mayor Bloomberg has provided over $6.7 million towards entrepreneurial programs that partner with Columbia and other universities in New York. Professor Chris Wiggins of the Fu Foundation School of Engineering and Applied Science is working in conjunction with Professors Evan Korth of New York University and Hilary Mason, chief scientist at bit.ly to facilitate the growth of student tech-startups in an effort to transform a traditionally financially centered New York City into the next Silicon Valley. Their website, hackny.org, is a gathering ground of ideas and discussions for New York's young entrepreneurial community, the Silicon Alley. On June 14, 2010, Mayor Michael R. Bloomberg launched the NYC Media Lab to promote innovations in New York's media industry. Situated at the New York University Tandon School of Engineering, the lab is a consortium of Columbia University, New York University, and New York City Economic Development Corporation acting to connect companies with universities in new technology research. The Lab is modeled after similar ones at MIT and Stanford. A $250,000 grant from the New York City Economic Development Corporation was used to establish the NYC Media Lab. Each year, the lab will host a range of roundtable discussions between the private sector and academic institutions. It will support research projects on topics of content format, next-generation search technologies, computer animation for film and gaming, emerging marketing techniques, and new devices development. The lab will also create a media research and development database. Columbia University will coordinate the long-term direction of the media lab as well as the involvement of its faculty and those of other universities. A member institution of the National Collegiate Athletic Association (NCAA) in Division I FCS, Columbia fields varsity teams in 29 sports and is a member of the Ivy League. The football Lions play home games at the 17,000-seat Robert K. Kraft Field at Lawrence A. Wien Stadium. The Baker Athletics Complex also includes facilities for baseball, softball, soccer, lacrosse, field hockey, tennis, track and rowing, as well as the new Campbell Sports Center opened in January 2013. The basketball, fencing, swimming & diving, volleyball and wrestling programs are based at the Dodge Physical Fitness Center on the main campus. Columbia University athletics has a long history, with many accomplishments in athletic fields. In 1870, Columbia played against Rutgers University in the second football game in the history of the sport. Eight years later, Columbia crew won the famed Henley Royal Regatta in the first-ever defeat for an English crew rowing in English waters. In 1900, Olympian and Columbia College student Maxie Long set the first official world record in the 400 meters with a time of 47.8 seconds. In 1983, Columbia men's soccer went 18-0 and was ranked first in the nation, but lost to Indiana 1-0 in double overtime in the NCAA championship game; nevertheless, the team went further toward the NCAA title than any Ivy League soccer team in history. The football program unfortunately is best known for its record of futility set during the 1980s: between 1983 and 1988, the team lost 44 games in a row, which is still the record for the NCAA Football Championship Subdivision. The streak was broken on October 8, 1988, with a 16-13 victory over archrival Princeton University. That was the Lions' first victory at Wien Stadium, which had been opened during the losing streak and was already four years old. A new tradition has developed with the Liberty Cup. The Liberty Cup is awarded annually to the winner of the football game between Fordham and Columbia Universities, two of the only three NCAA Division I football teams in New York City. The tradition began in 2002, a year after the Fordham-Columbia game was postponed due to the September 11 attacks. Established in 2003 by university president Lee C. Bollinger, the World Leaders Forum at Columbia University provides the opportunity for undergraduate and graduate students alike to listen to world leaders in government, religion, industry, finance, and academia. The World Leaders Forum is a year-around event series that strives to provide a platform for uninhibited speech among nations and cultures, while educating students about problems and progress around the globe. Past forum speakers include former President of the United States Bill Clinton, the Prime Minister of India Atal Bihari Vajpayee, Former President of Ghana John Agyekum Kufuor, President of Afghanistan Hamid Karzai, Prime Minister of Russia Vladimir Putin, President of the Republic of Mozambique Joaquim Alberto Chissano, President of the Republic of Bolivia Carlos Diego Mesa Gisbert, President of the Republic of Romania Ion Iliescu, President of the Republic of Latvia Vaira Vīķe-Freiberga, the first female President of Finland Tarja Halonen, President Yudhoyono of Indonesia, President Pervez Musharraf of the Islamic Republic of Pakistan, Iraq President Jalal Talabani, the 14th Dalai Lama, President of the Islamic Republic of Iran Mahmoud Ahmadinejad, financier George Soros, Mayor of New York City Michael R. Bloomberg, President Václav Klaus of the Czech Republic, President Cristina Fernández de Kirchner of Argentina, former Secretary-General of the United Nations Kofi Annan, and Al Gore. There are a number of performing arts groups at Columbia dedicated to producing student theater, including the Columbia Players, King's Crown Shakespeare Troupe (KCST), Columbia Musical Theater Society (CMTS), NOMADS (New and Original Material Authored and Directed by Students), LateNite Theatre, Columbia University Performing Arts League (CUPAL), Black Theatre Ensemble (BTE), sketch comedy group Chowdah, and improvisational troupes Alfred and Fruit Paunch. The Columbia University Marching Band tells jokes during the campus tradition of Orgo Night. The Columbia Queer Alliance is the central Columbia student organization that represents the bisexual, lesbian, gay, transgender, and questioning student population. It is the oldest gay student organization in the world, founded as the Student Homophile League in 1967 by students including lifelong activist Stephen Donaldson. Columbia University campus military groups include the U.S. Military Veterans of Columbia University and Advocates for Columbia ROTC. In the 2005–06 academic year, the Columbia Military Society, Columbia's student group for ROTC cadets and Marine officer candidates, was renamed the Hamilton Society for "students who aspire to serve their nation through the military in the tradition of Alexander Hamilton". The protests achieved two of their stated goals. Columbia disaffiliated from the IDA and scrapped the plans for the controversial gym, building a subterranean physical fitness center under the north end of campus instead. A popular myth states that the gym's plans were eventually used by Princeton University for the expansion of its athletic facilities, but as Jadwin Gymnasium was already 50% complete by 1966 (when the Columbia gym was announced) this was clearly not correct. At least 30 Columbia students were suspended by the administration as a result of the protests. Many of the Class of '68 walked out of their graduation and held a countercommencement on Low Plaza with a picnic following at Morningside Park, the place where the protests began. The protests hurt Columbia financially as many potential students chose to attend other universities and some alumni refused to donate money to the school. Allan Bloom, a professor of philosophy at the University of Chicago, believed that the protest efforts at Columbia were responsible for pushing higher education further toward the liberal left. As a result of the protests, Bloom stated, "American universities were no longer places of intellectual and academic debate, but rather places of 'political correctness' and liberalism." The initial (and partial) Columbia divestment, focused largely on bonds and financial institutions directly involved with the South African regime. It followed a year-long campaign first initiated by students who had worked together to block the appointment of former United States Secretary of State Henry Kissinger to an endowed chair at the university in 1977. Broadly backed by student groups and many faculty members the Committee Against Investment in South Africa held teach-ins and demonstrations through the year focused on the trustees ties to the corporations doing business with South Africa. Trustee meetings were picketed and interrupted by demonstrations culminating in May 1978 in the takeover of the Graduate School of Business. The School of International and Public Affairs extends invitations to heads of state and heads of government who come to New York City for the opening of the fall session of the United Nations General Assembly. In 2007, Iranian President Mahmoud Ahmadinejad was one of those invited to speak on campus. Ahmadinejad accepted his invitation and spoke on September 24, 2007, as part of Columbia University's World Leaders Forum. The invitation proved to be highly controversial. Hundreds of demonstrators swarmed the campus on September 24 and the speech itself was televised worldwide. University President Lee C. Bollinger tried to allay the controversy by letting Ahmadenijad speak, but with a negative introduction (given personally by Bollinger). This did not mollify those who were displeased with the fact that the Iranian leader had been invited onto the campus. Columbia students, though, turned out en masse to listen to the speech on the South Lawn. An estimated 2,500 undergraduates and graduates came out for the historic occasion. Beginning in 1969, during the Vietnam War, the university did not allow the U.S. military to have Reserve Officers' Training Corps (ROTC) programs on campus, though Columbia students could participate in ROTC programs at other local colleges and universities. At a forum at the university during the 2008 presidential election campaign, both John McCain and Barack Obama said that the university should consider reinstating ROTC on campus. After the debate, the President of the University, Lee C. Bollinger, stated that he did not favor reinstating Columbia's ROTC program, because of the military's anti-gay policies. In November 2008, Columbia's undergraduate student body held a referendum on the question of whether or not to invite ROTC back to campus, and the students who voted were almost evenly divided on the issue. ROTC lost the vote (which would not have been binding on the administration, and did not include graduate students, faculty, or alumni) by a fraction of a percentage point. In April 2010 during Admiral Mike Mullen's address at Columbia, President Lee C. Bollinger stated that the ROTC would be readmitted to campus if the admiral's plans for revoking the don't ask, don't tell policy were successful. In February 2011 during one of three town-hall meetings on the ROTC ban, former Army staff sergeant Anthony Maschek, a Purple Heart recipient for injuries sustained during his service in Iraq, was booed and hissed at by some students during his speech promoting the idea of allowing the ROTC on campus. In April 2011 the Columbia University Senate voted to welcome the ROTC program back on campus. Secretary of the Navy Ray Mabus and Columbia University President Lee C. Bollinger signed an agreement to reinstate Naval Reserve Officers Training Corps (NROTC) program at Columbia for the first time in more than 40 years on May 26, 2011. The agreement was signed at a ceremony on board the USS Iwo Jima, docked in New York for the Navy's annual Fleet Week. In February 2014, after learning that the university had over $10 million invested in the private prison industry, a group of students delivered a letter President Bollinger’s office requesting a meeting and officially launching the Columbia Prison Divest (CPD) campaign. As of June 30, 2013, Columbia held investments in Corrections Corporation of America, the largest private prison company in the United States, as well as G4s, the largest multinational security firm in the world. Students demanded that the university divest these holdings from the industry and instate a ban on future investments in the private prison industry. Aligning themselves with the growing Movement for Black Lives and in conversation with the heightened attention on race and the system of mass incarceration, CPD student activists hosted events to raise awareness of the issue and worked to involve large numbers of members of the Columbia and West Harlem community in campaign activities. After eighteen months of student driven organizing, the Board of Trustees of Columbia University voted to support the petition for divestment from private prison companies, which was confirmed to student leaders on June 22, 2015. The Columbia Prison Divest campaign was the first campaign to successfully get a U.S. university to divest from the private prison industry. In one of the school's longest-lasting traditions, begun in 1975, at midnight before the Organic Chemistry exam—often the first day of final exams—the Columbia University Marching Band invaded and briefly occupied the main undergraduate reading room in Butler Library to distract and entertain studying students with some forty-five minutes of raucous jokes and music, beginning and ending with the singing of the school's fight song, "Roar, Lion, Roar". After the main show before a crowd that routinely began filling the room well before the announced midnight start time, the Band led a procession to several campus locations, including the residential quadrangle of Barnard College for more music and temporary relief from the stress of last-minute studying. In December 2016, following several years of sporadic complaints by students who said that some Orgo Night scripts and advertising posters left them "triggered" and "traumatized" and called for the show to be canceled, as well as a New York Times article on the Band's treatment of sexual assault on campus, University administrators banned the Marching Band from performing its Orgo Night show in the traditional Butler Library location. Protests and accusations of censorship followed, but University President Lee Bollinger maintained that complaints and publicity about the shows had "nothing to do with" the prohibition. In subfreezing weather, the Band instead performed—at midnight, as usual—outside the main entrance of Butler Library. The campus Tree-Lighting Ceremony was inaugurated in 1998. It celebrates the illumination of the medium-sized trees lining College Walk in front of Kent and Hamilton Halls on the east end and Dodge and Journalism Halls on the west, just before finals week in early December. The lights remain on until February 28. Students meet at the sun-dial for free hot chocolate, performances by a cappella groups, and speeches by the university president and a guest. The university has graduated many notable alumni, including five Founding Fathers of the United States, including an author of the United States Constitution and a member of the Committee of Five;[n 1] As of 2011, there were 125 Pulitzer Prize winners and 39 Oscar winners, as well as three United States presidents. As of 2006, there were 101 National Academy members who were alumni. In a 2016 ranking of universities worldwide with respect to living graduates who are billionaires, Columbia ranked second, after Harvard. Former U.S. Presidents Theodore Roosevelt and Franklin Delano Roosevelt attended the law school. Other political figures educated at Columbia include former U.S President Barack Obama, Associate Justice of the U.S. Supreme Court Ruth Bader Ginsburg, former U.S. Secretary of State Madeleine Albright, former chairman of the U.S. Federal Reserve Bank Alan Greenspan, U.S. Attorney General Eric Holder, and U.S. Solicitor General Donald Verrilli Jr. Dwight D. Eisenhower served as the thirteenth president of Columbia University from 1948 to 1953. The university has also educated 26 foreign heads of state, including President of Georgia Mikheil Saakashvili, President of East Timor Jose Ramos Horta, President of Estonia Toomas Hendrik Ilves and other historical figures such as Wellington Koo, Radovan Karadžić, Gaston Eyskens, and T. V. Soong. [n 2] The author of India's constitution and Dalit leader Dr. B. R. Ambedkar was also an alumnus of Columbia. Alumni of Columbia have occupied top positions in Wall Street and the rest of the business world. Notable members of the Astor family attended Columbia, while other business graduates include investor Warren Buffett, former CEO of PBS and NBC Larry Grossman, chairman of Wal-Mart S. Robson Walton and Bain Capital Co-Managing Partner, Jonathan Lavine. CEO's of top Fortune 500 companies include James P. Gorman of Morgan Stanley, Robert J. Stevens of Lockheed Martin, Philippe Dauman of Viacom, Ursula Burns of Xerox, and Vikram Pandit of Citigroup. Notable labor organizer and women's educator Louise Leonard McLaren received her degree of Master of Arts from Columbia. In science and technology, Columbia alumni include: founder of IBM Herman Hollerith; inventor of FM radio Edwin Armstrong; Francis Mechner; integral in development of the nuclear submarine Hyman Rickover; founder of Google China Kai-Fu Lee; scientists Stephen Jay Gould, Robert Millikan, Helium–neon laser inventor Ali Javan and Mihajlo Pupin; chief-engineer of the New York City Subway, William Barclay Parsons; philosophers Irwin Edman and Robert Nozick; economist Milton Friedman; psychologist Harriet Babcock; and sociologists Lewis A. Coser and Rose Laub Coser. Many Columbia alumni have gone on to renowned careers in the arts, including composers Richard Rodgers, Oscar Hammerstein II, Lorenz Hart, and Art Garfunkel. Four United States Poet Laureates received their degrees from Columbia. Columbia alumni have made an indelible mark in the field of American poetry and literature, with such people as Jack Kerouac and Allen Ginsberg, pioneers of the Beat Generation, and Langston Hughes, a seminal figure in the Harlem Renaissance, all having attended the university. Other notable writers who attended Columbia include authors Isaac Asimov, J.D. Salinger, Upton Sinclair, Danielle Valore Evans, and Hunter S. Thompson. University alumni have also been very prominent in the film industry, with 28 alumni and former students winning a combined 39 Academy Awards (as of 2011). Some notable Columbia alumni that have gone on to work in film include directors Sidney Lumet (12 Angry Men) and Kathryn Bigelow (The Hurt Locker), screenwriters Howard Koch (Casablanca) and Joseph L. Mankiewicz (All About Eve), and actors James Cagney and Ed Harris. ↑ Founding Fathers include: Alexander Hamilton, John Jay, Robert R. Livingston, Egbert Benson, and Gouverneur Morris. ↑ Foreign heads of state include: Muhammad Fadhel al-Jamali, Giuliano Amato, Hafizullah Amin, Nahas Angula, Marek Belka, Fernando Henrique Cardoso, Gaston Eyskens, Mark Eyskens, Jose Ramos Horta, Lee Huan, Toomas Hendrik Ilves, Wellington Koo, Benjamin Mkapa, Mikhail Saakashvili, Mohammad Musa Shafiq, Salim Ahmed Salim, Ernesto Samper, Tang Shaoyi, Abdul Zahir, Zhou Ziqi, Wlodzimierz Cimoszewicz, Sun Fo, Chen Gongbo, Nwafor Orizu Juan Bautista Sacasa, and T. V. Soong. ↑ Columbia University (2012). "Columbia University at a Glance". Retrieved April 12, 2012. ↑ As of June 30, 2017. "Columbia University Posts 13.7% Annual Return". 2017. 1 2 3 "Full-time, part-time headcount and full-time equivalent enrollment by degree status, Fall 2014". Columbia University Office of Planning and Institutional Research. September 9, 2014. ↑ "Colors | Identity Guidelines". Retrieved August 9, 2018. ↑ "The Course of History". Columbia University. 2004. Retrieved November 22, 2004. ↑ "CC, SEAS admit rate drops to record-low 5.5 percent". columbiaspectator.com. Retrieved March 31, 2018. 1 2 3 4 5 "A Brief History of Columbia". Columbia University. 2011. Retrieved April 14, 2011. ↑ "Residential Life". Retrieved August 3, 2015. ↑ "Member Institutions". Association of American Universities. Retrieved April 18, 2011. ↑ Seymour Topping. "Pulitzer Administration". Pulitzer.org. Retrieved April 18, 2011. 1 2 3 "Members By Parent Institution". National Academy of Engineering. Archived from the original on June 15, 2006. Retrieved August 10, 2006. ↑ Kathleen Elkins. "The 10 colleges that produce the most billionaires". CNBC. Retrieved July 5, 2018. 1 2 3 "Columbia Arts Alumni". Columbia University. Archived from the original on January 23, 2011. Retrieved June 28, 2011. 1 2 McCaughey, Robert (2003). Stand, Columbia : A History of Columbia University in the City of New York. New York, New York: Columbia University Press. p. 1. ISBN 0-231-13008-2. ↑ Schecter, Barnet (2002). The Battle for New York: The City at the Heart of the American Revolution. Walker & Company. ISBN 978-0-8027-1374-2. ↑ McCullough, David (2005). 1776. Simon & Schuster. ISBN 978-0-7432-2671-4. ↑ "No. 12910". The London Gazette. August 7, 1787. p. 373. 1 2 A History of Columbia University, 1754–1904. New York: Macmillan. 1904. ISBN 1-4021-3737-0. ↑ McCaughey, Robert (December 10, 2003). "Leading American University Producers of PhDs, 1861–1900". Stand, Columbia – A History of Columbia University. Columbia University Press. Archived from the original on September 9, 2006. Retrieved August 10, 2006. ↑ McCaughey, Robert (2012). Stand, Columbia: A History of Columbia University. Columbia University Press. ISBN 9780231503556. ↑ "History - Columbia University in the City of New York". www.columbia.edu. Retrieved July 11, 2017. ↑ Broad, William J. (October 30, 2007). "Why They Called It the Manhattan Project". The New York Times. Retrieved October 30, 2007. ↑ Stand, Columbia: A History of Columbia University in the City of New York ... – Robert A. McCaughey – Google Books. Books.google.com. Retrieved January 5, 2014. ↑ "Columbia Daily Spectator 3 April 1928 — Columbia Spectator". Retrieved November 24, 2016. ↑ "School of General Studies: History". Columbia School of General Studies. Retrieved June 10, 2011. ↑ "What makes GS different from Columbia's traditional undergraduate colleges?". Retrieved November 24, 2016. ↑ "University Senate". Retrieved November 24, 2016. ↑ "History – Columbia University School of Professional Studies". Retrieved November 24, 2016. ↑ "History – Columbia University in the City of New York". Retrieved November 24, 2016. ↑ Kurlansky, Mark (2005). 1968: The Year That Rocked The World. New York, New York: Random House. pp. 194–199. ISBN 0-345-45582-7. ↑ Bradley, Stefan (2009). Harlem vs. Columbia University: Black Student Power in the Late 1960s. New York, New York: University of Illinois. pp. 5–19, 164–191. ISBN 978-0-252-03452-7. ↑ Reception honors anniversary of CC coeducation | Columbia Daily Spectator. Columbiaspectator.com. Retrieved on September 7, 2013. ↑ "GSAS at a Glance – Columbia University – Graduate School of Arts and Sciences". Archived from the original on March 10, 2014. Retrieved November 24, 2016. ↑ "History – Faculty of Arts and Sciences". Retrieved November 24, 2016. ↑ Soler, Alina. "Columbia University". New York. Retrieved July 17, 2017. ↑ Duncan, Steve (March 31, 2006). "Finding History In Radioactive Storage Rooms". Undercity.org. Archived from the original on February 17, 2007. Retrieved April 16, 2011. ↑ Duncan, Steve (July 20, 2005). "Old Coal Hoppers, Columbia University". Undercity.org. Archived from the original on February 17, 2007. Retrieved April 16, 2011. ↑ "Butler Library: Self-Guided Tour" (PDF). Columbia University. Retrieved April 11, 2011. ↑ "Libraries and Collections: Fast Facts". Columbia University. Retrieved April 11, 2013. ↑ "The Nation's Largest Libraries: A Listing By Volumes Held". American Library Association. Retrieved April 11, 2013. ↑ Carolyn Pitts (1987). "National Register of Historic Places Inventory-Nomination: Low Memorial Library, Columbia". National Park Service. ↑ "National Register of Historic Places Inventory-Nomination: Pupin Physics Laboratories, Columbia University--Accompanying photos". National Park Service. 1983. ↑ Smithsonian American Art Museum's Inventories of American Painting and Sculpture. "Alma Mater (sculpture)". The Smithsonian Institution. Retrieved April 14, 2011. ↑ Meredith Foster (February 11, 2011). "The Myth of the College Sweetheart". The Eye. Columbia Spectator. Archived from the original on March 7, 2011. Retrieved April 14, 2011. ↑ "What Is the Mace? A Guide to Columbia's Icons". Columbia University Record. May 19, 1999. Retrieved April 16, 2011. ↑ Richard P. Dober. "The Steps at Low Library" (PDF). Dober, Lidsky, Craig and Associates, Inc. Archived from the original (PDF) on April 18, 2011. Retrieved April 11, 2011. ↑ "Columbia University Steps". Project for Public Spaces. Archived from the original on July 6, 2011. Retrieved April 11, 2011. ↑ "Manhattanville in West Harlem". Retrieved April 1, 2007. ↑ Williams, Timothy (November 20, 2006). "In West Harlem Land Dispute, It's Columbia vs. Residents". The New York Times. ↑ Williams, Timothy (September 21, 2008). "2 Gas Stations, and a Family's Resolve, Confront Columbia Expansion Plan". The New York Times. Retrieved March 28, 2010. ↑ Astor, Maggie; Kim Kirschenbaum (December 18, 2008). "M'ville Expansion Clears Last Major Hurdle, State Approves Eminent Domain". Columbia Spectator. Retrieved August 12, 2009. ↑ "Columbia Manhattanville Project". Press Release. May 20, 2009. Archived from the original on May 6, 2010. Retrieved August 12, 2009. ↑ "NYP: Weschster". New York-Presbyterian Hospital. Archived from the original on October 4, 2011. Retrieved April 18, 2011. ↑ "Manhattanville in West Harlem". Columbia University. Archived from the original on December 12, 2014. Retrieved April 11, 2011. ↑ "Projects: Green Buildings". Columbia Environmental Stewardship. Archived from the original on May 8, 2014. Retrieved April 11, 2011. ↑ "Columbia Greenmarket". GrowNYC. Retrieved April 11, 2011. ↑ "Columbia University Green Report Card". The College Sustainability Report Card. Retrieved April 11, 2011. ↑ "Columbia University Green Report Card". College Sustainability Report Card. Retrieved April 18, 2011. ↑ Jackson, Abby (April 1, 2016). "Ivy League acceptance rates for the class of 2020". Business Insider. Retrieved April 1, 2016. ↑ "CC, SEAS admit rate drops to record-low 5.5 percent - Columbia Daily Spectator". www.columbiaspectator.com. Retrieved 2018-03-31. ↑ "Financial Aid Statistics". Columbia University. ↑ "Columbia University Tuition And Costs". Retrieved November 22, 2016. ↑ Beatty, Sally (April 11, 2007). "Columbia to Get Huge Bequest from John Kluge". The Wall Street Journal. Retrieved March 14, 2018. ↑ "Columbia University to Offer Financial Aid to More Students". The New York Times. March 11, 2008. Retrieved March 28, 2010. ↑ Steinberg, Jacques (March 23, 2010). "Columbia, Michigan and Connecticut Among 25 Colleges to Add Common Application". The New York Times. Retrieved April 11, 2011. ↑ "The Named Scholars". Retrieved August 3, 2015. ↑ Gross, Jessica (2013-11-10). "Who Made That College Application?". The New York Times. Retrieved 2018-08-31. 1 2 "Board of Trustees". Columbia University. Retrieved April 17, 2011. ↑ "Columbia University Senate". Columbia University. Retrieved April 17, 2011. ↑ "Office of the President: Lee Bollinger". Retrieved April 14, 2011. ↑ "Schools of Columbia University". Columbia University. Retrieved April 17, 2011. ↑ "JTS Joint Program". gs.columbia.edu. Retrieved 2018-01-19. ↑ "Columbia-Juilliard Program | Columbia Undergraduate Admissions". undergrad.admissions.columbia.edu. Retrieved 2018-01-19. ↑ Patti, Jill Pasternak, Joe. "Crossing Boundaries from Past to Future: Pianist Conrad Tao on Crossover". Retrieved 2018-01-19. ↑ "Joint LLB/Juris Doctor (JD) with Columbia University, New York". University College London. Retrieved July 29, 2016. ↑ "Dual BA Program Between Columbia University and Sciences Po". Retrieved August 3, 2015. ↑ "Joint Bachelor's Degree Program between City University of Hong Kong and Columbia University". Retrieved August 12, 2016. ↑ "Dual BA Program | Trinity College Dublin". gs.columbia.edu. Retrieved 2018-01-06. ↑ "Columbia University Global Centers". Columbia University. Archived from the original on October 28, 2011. Retrieved May 4, 2011. ↑ "Columbia University - U.S. News Best Grad School Rankings". U.S. News & World Report. Retrieved May 13, 2017. ↑ "Columbia University - U.S. News Best Global University Rankings". U.S. News & World Report. Retrieved July 20, 2017. ↑ "Wall Street Journal/Times Higher Education College Rankings". Wall Street Journal/Times Higher Education. Retrieved October 17, 2017. ↑ "National University Rankings". U.S. News & World Report. Archived from the original on May 21, 2011. Retrieved November 3, 2015. ↑ "National University Rankings: Columbia University". U.S. News & World Report. Retrieved November 3, 2015. ↑ DI releases Design School Rankings for 2013, Archinect News, Reporting rankings from DesignIntelligence for best Architecture and Design Schools. By James P. Cramer of DI. November 1, 2012. Retrieved November 3, 2012. ↑ "Top 10 Journalism Schools in the U.S". Education-portal.com. Retrieved October 30, 2010. ↑ "Faculty | Columbia University Office of Undergraduate Admissions". Studentaffairs.columbia.edu. Retrieved February 22, 2010. ↑ "Nobel Prize Winners: Current Faculty". Columbia University. Retrieved April 11, 2011. 1 2 3 4 "Faculty". Columbia University Office of Undergraduate Admissions. 2005. Retrieved August 10, 2006. ↑ "Membership Directory". Institute of Medicine of the National Academies. Archived from the original on September 26, 2007. Retrieved August 10, 2006. ↑ BRIAN TUMULTY (April 13, 2015). "Half of N.Y. colleges pay profs less than $100K". Ithaca Journal. Retrieved August 3, 2015. ↑ Guenther, Katja (2015). Localization and Its Discontents: A Genealogy of Psychoanalysis and the Neuro Disciplines. Chicago: University of Chicago Press. p. 155. ISBN 978-0-226-28820-8. ↑ "Columbia To Go" (PDF). Columbia University. Archived from the original (PDF) on June 5, 2007. Retrieved April 29, 2007. ↑ Herper, Matthew (July 26, 2001). "Biotech's Glowing Breakthrough". Forbes. Retrieved February 27, 2008. 1 2 "New Inventions / New Discoveries" (PDF). Columbia University Science and Technology Ventures. Archived from the original (PDF) on June 13, 2007. Retrieved April 29, 2007. 1 2 "Science and Technology Ventures – Success Stories". Columbia University Science and Technology Ventures. Archived from the original on February 21, 2008. Retrieved February 27, 2008. ↑ Reedy, Katie (November 28, 2006). "Patents Bring in the Cash to Columbia". Columbia Spectator. Retrieved July 11, 2016. ↑ "Headcount enrollment by school, race/ethnicity, and citizenship, Fall 2014". Columbia University Office of Planning and Institutional Research. September 12, 2014. ↑ "Housing and Dining". Columbia University Office of Student Affairs. Retrieved April 16, 2011. ↑ Office of Undergraduate Admissions site about Campus Life. Retrieved September 12, 2007. ↑ "The Alpha Delta Phi Society: About Us". Archived from the original on February 7, 2011. Retrieved April 11, 2011. ↑ "Fraternity and Sorority Life at Columbia". Columbia University. Retrieved April 17, 2011. ↑ "Columbia Daily Spectator". Retrieved August 10, 2006. ↑ "Blue & White". Retrieved August 10, 2006. ↑ "Columbia Political Review". Retrieved December 26, 2008. ↑ "AdHoc". Retrieved August 10, 2006. ↑ "The Columbia Review". Archived from the original on August 4, 2006. Retrieved August 10, 2006. ↑ "Columbia Journal of Literary Criticism". Archived from the original on October 9, 2006. Retrieved December 7, 2006. ↑ "The Mobius Strip". Retrieved August 10, 2006. ↑ "Inside New York". Archived from the original on July 3, 2011. Retrieved October 26, 2009. ↑ "Journal of Politics & Society". Retrieved August 10, 2006. ↑ "Publius: About". Archived from the original on July 27, 2011. Retrieved April 17, 2011. ↑ "East Asia Review: About Us". East Asia Review. Archived from the original on April 20, 2011. Retrieved April 17, 2011. ↑ "The Birch". Retrieved August 10, 2006. ↑ "History and Vision". Columbia Science Review. Retrieved April 17, 2011. ↑ "The Fed". Archived from the original on August 4, 2006. Retrieved August 10, 2006. ↑ "Jester of Columbia". Archived from the original on July 13, 2011. Retrieved August 10, 2006. ↑ "The Columbian". Columbia University. Retrieved April 17, 2011. ↑ "The Gadfly: About". The Gadlfy. Archived from the original on May 9, 2011. Retrieved April 17, 2011. ↑ "The Rhapsody". Columbia University. Archived from the original on June 24, 2010. Retrieved April 17, 2011. ↑ "Current Musicology". Retrieved August 10, 2006. ↑ "The Journal of Philosophy". Retrieved August 10, 2006. ↑ Michael Rennick (January 14, 2008). "About the Journal". TCRecord. Retrieved February 22, 2010. ↑ "About Us: Mission Statement". Columbia Journalism Review. Retrieved April 16, 2011. ↑ ""The Original FM": The Columbia University Radio Club". Columbia University. 2009. Retrieved January 12, 2013. ↑ "CTV News". Archived from the original on November 4, 2006. Retrieved August 10, 2006. ↑ "CTV". Archived from the original on August 20, 2006. Retrieved August 10, 2006. ↑ "History". Philolexian Society. February 1, 2010. Retrieved April 11, 2011. ↑ Jaynes, Gregory (December 5, 1987). "No, Not a Curse But a Jersey Prize For Worst Verse". The New York Times. Retrieved April 16, 2011. ↑ "Columbia Parliamentary Debate Team". Retrieved August 10, 2006. ↑ "CIRCA – About". Archived from the original on July 25, 2011. Retrieved August 10, 2006. ↑ "CIRCA – Traveling team awards". Archived from the original on July 25, 2011. Retrieved August 10, 2006. ↑ Jon Swartz, USA TODAY (September 17, 2013). "Square's Jack Dorsey goes recruiting in NYC". USA TODAY. Retrieved August 3, 2015. ↑ Cormier, Amanda (October 7, 2010). "Columbia's Web 3.0". The Eye. Archived from the original on November 2, 2010. Retrieved October 30, 2010. ↑ "Engaged Entrepreneurship". Columbia University. Archived from the original on December 10, 2010. Retrieved April 16, 2011. ↑ Kathleen, Mary (June 7, 2010). "Mecca on the Hudson?". The Deal. Archived from the original on September 8, 2010. Retrieved October 30, 2010. ↑ Wortham, Jenna (March 6, 2010). "New York Isn't Silicon Valley, and That's Why They Like It". The New York Times. 1 2 "Mayor Bloomberg launches NYC Media Lab" (Press release). The City of New York. June 14, 2010. Retrieved October 30, 2010. ↑ "Athletics". Columbia University. Retrieved April 16, 2011. ↑ Carft, Julie (July 29, 1989). "Image is Heavy Burden – Weightlifter Karyn Marshall Feels Pressure to Project 'Femininity, Intelligence'". Los Angeles Times. Retrieved October 2, 2009. ↑ Lidz, Franz (March 21, 1988). "A Lift For Wall Street". Sports Illustrated. Archived from the original on October 11, 2011. Retrieved June 28, 2009. ↑ Baker Field: Birthplace of Sports Television Archived October 7, 2008, at the Wayback Machine.. Columbia University. ↑ "20th-Century Greats". Columbia University. Retrieved April 11, 2011. ↑ "Columbia Athletics Highlight". Columbia University. 2004. Retrieved April 11, 2011. ↑ Losing streak. Wikicu.com. Retrieved on September 7, 2013. ↑ "About the World Leaders Forum". Archived from the original on August 28, 2015. Retrieved August 3, 2015. ↑ "World Leaders Forum: Frequently Asked Questions". Worldleaders.columbia.edu. Archived from the original on July 19, 2011. Retrieved April 11, 2011. ↑ "Participants | Columbia University World Leaders Forum". Worldleaders.columbia.edu. Archived from the original on September 17, 2010. Retrieved October 30, 2010. ↑ "Columbia University Orchestra". Columbia University Orchestra. Archived from the original on June 24, 2015. Retrieved August 3, 2015. ↑ "CUPAL: Member Organizations". Columbia University of Performing Arts. Retrieved April 16, 2011. ↑ "Orgo Night! A Columbia University Marching Band Tradition". Columbia University Marching Band. Archived from the original on June 22, 2010. Retrieved April 11, 2011. ↑ "About Us". Columbia Queer Alliance. Retrieved April 16, 2011. ↑ Queer Man on Campus: A History of Non-heterosexual College Men, 1945–2000. Psychology Press. 2002. p. 167. ISBN 0-415-93336-6. ↑ "Columbia University Hamilton Society: About". Retrieved April 11, 2011. ↑ "Community Impact". Columbia University. Retrieved December 29, 2010. ↑ "Columbia's Radicals of 1968 Hold a Bittersweet Reunion". The New York Times. April 28, 2008. ↑ "Columbia University – 1968". Retrieved August 3, 2015. ↑ Hevesi, Dennis. "Gym Groundbreaking Will Be Held Next Month", Columbia Spectator, September 29, 1966. ↑ George Keller. Columbia College Today (PDF). Columbia University. Archived from the original (PDF) on June 14, 2011. Retrieved April 11, 2011. ↑ Bradley, Stefan (2009). Harlem vs. Columbia University: Black Student Power in the Late 1960s. New York, New York: University of Illinois. pp. 5–19, 164–191, 174. ISBN 978-0-252-03452-7. ↑ "Disinvestment from South Africa#University campuses"
↑ "Columbia Senate Supports Selling South African Stocks Selectively". The New York Times. May 7, 1978. ↑ "Trustees vote for divestiture from backers of S. African government". Columbia Spectator. June 8, 1978. ↑ "400 sign petition against offering Kissinger faculty post". Columbia Spectator. March 3, 1977. ↑ "Demonstration at Columbia". New York Daily News. May 2, 1978. ↑ "Student Sit-in at Columbia". New York Post. May 2, 1978. ↑ "President Bollinger's Statement About President Ahmadinejad's Scheduled Appearance". Columbia News. September 19, 2007. ↑ "Candidates Speak Out On Ahmadinejad Visit". CBS News. September 24, 2007. ↑ "Iran president in NY campus row". BBC News Online. September 25, 2007. Retrieved March 11, 2010. ↑ Vincent, Isabel (November 22, 2009). "Schools' Iran $ pipeline". New York Post. Retrieved February 8, 2013. ↑ Feith, David J., "Duty, Honor, Country… and Columbia", National Review, September 15, 2008. Archived September 17, 2008, at the Wayback Machine. ↑ "U.S. Air Force ROTC – College Life – College". Afrotc.com. Archived from the original on December 5, 2010. Retrieved February 22, 2010. 1 2 "AFROTC Detachment 560, "The Bronx Bombers", CROSS-TOWN SCHOOLS". Archived from the original on April 27, 2014. Retrieved January 14, 2009. ↑ NAVY ROTC IN NEW YORK CITY Archived June 18, 2013, at the Wayback Machine. ↑ McGurn, William, "A Columbia Marine To Obama: Help! ", Wall Street Journal, September 30, 2008, Page 17. ↑ Colleges and Universities with NROTC Units Archived August 2, 2007, at the Wayback Machine. ↑ Karni, Annie, "", New York Post, February 20, 2011. ↑ , "Huff Post College", April 2, 2011. ↑ Sestanovich, Clare (March 20, 2015). "Columbia Students to Lee Bollinger: Divest From Prisons Now!". The Nation. ISSN 0027-8378. Retrieved November 14, 2017. 1 2 "The New Divestment Movement". Retrieved November 14, 2017. ↑ CNN, Wilfred Chan. "Columbia is first U.S. university to divest from prisons - CNN". CNN. Retrieved November 14, 2017. ↑ "Columbia Cram Session Can Be Fun, Too". The New York Times. 1975-12-20. Retrieved April 23, 2018. ↑ "If you go to Orgo Night, you're part of the problem". Columbia Daily Spectator. Retrieved April 23, 2018. ↑ Taylor, Kate (2015-05-09). "This Year, Columbia Event Finds Joke Fodder in Sexual Assault Debate". The New York Times. Retrieved December 22, 2017. ↑ "University denies marching band access to Butler Library for Orgo Night – Columbia Daily Spectator". columbiaspectator.com. Retrieved January 20, 2017. ↑ "Bollinger defends University's decision to ban Orgo Night from Butler – Columbia Daily Spectator". columbiaspectator.com. Retrieved January 20, 2017. ↑ "Orgo Night!". columbiabandalumni.org. Retrieved April 23, 2018. ↑ "In Defense of Orgo Night". Retrieved January 20, 2017. ↑ "University stands by decision to ban Orgo Night from Butler as alumni pressure mounts - Columbia Daily Spectator". columbiaspectator.com. Retrieved July 11, 2017. ↑ Piper, Greg (2017-12-21). "How Columbia's politically incorrect marching band outwitted the administration's censorship attempt". The College Fix. Retrieved December 22, 2017. ↑ Jason Hollander. "Holiday Season Ushered In With Tree-Lighting Ceremony". Columbia University News. Retrieved April 15, 2011. ↑ Hollander, Jason (December 3, 1999). "Holiday Season Ushered In With Tree-Lighting Ceremony". Columbia News. Retrieved August 10, 2006. ↑ "The Varsity Show, April 15–18". Columbia University. January 10, 2005. Retrieved December 3, 2006. ↑ Chernow, Ron (2004). Alexander Hamilton. Penguin Books. p. 51. ISBN 978-1-59420-009-0. ↑ "A Brief Biography of John Jay". The Papers of John Jay. Columbia University. 2002. ↑ "Egbert Benson". Biographical Directory of the United States Congress. Retrieved April 16, 2011. ↑ Wright Jr., Robert K (1987). "Gouverneur Morris". Soldier-Statesmen of the Constitution. United States Army Center of Military History. CMH Pub 71-25. Retrieved April 13, 2011. ↑ "The Presidents of the United States – Biographical Sketches". US National Park Service. Archived from the original on June 30, 2007. Retrieved April 13, 2011. ↑ "The Universities Churning Out The Most Billionaires". Forbes. November 29, 2016. ↑ Marie Thibault. "In Pictures: Billionaire University". Forbes. Retrieved April 12, 2011. ↑ "Columbia News Announcement". Columbia.edu. Retrieved April 16, 2011. ↑ "Tribute: The Legacy of Ruth Bader Ginsburg and WRP Staff". American Civil Liberties Union. March 7, 2006. Retrieved April 16, 2011. ↑ Albright, Madeleine (2003). Madam Secretary: A Memoir. Miramax. p. 71. ISBN 0-7868-6843-0. ↑ Martin, Justin (October 15, 2009). Greenspan: The Man behind Money. Cambridge, Massachusetts: Basic Books. pp. 27–31. ISBN 0-7382-0275-4. ↑ Tucker-Hamilton, Racine; Hickey, Matthew (December 17, 2004). "Interview with Eric H. Holder, Jr" (Interview). Oral history project. The History Makers. Retrieved November 18, 2008. ↑ "Columbia 250: Dwight Eisenhower". Columbia University. Retrieved May 3, 2011. ↑ Muhammad Fadhel al-Jamali. "Experiences In Arab Affairs". Harvard University. Retrieved April 18, 2011. ↑ Daniel Peterson (November 29, 2007). "An Interview with Giuliano Amato". The Florentine. Retrieved April 18, 2011. ↑ Amstutz, Bruce (1994). Afghanistan: The First Five Years of Soviet Occupation. DIANE Publishing. p. 303. ISBN 0-7881-1111-6. ↑ "Namibia PM is Nahas Angula...Educated in the US". Newsday. October 13, 2009. Retrieved April 18, 2011. ↑ "The Biography of Marek Belka". United Nations. Archived from the original on February 5, 2009. Retrieved April 18, 2011. ↑ "Fernando Henrique Cardoso". Fulbright Association. Archived from the original on March 16, 2011. Retrieved April 18, 2011. ↑ "Honorary Degree Recipients" (PDF). Columbia University. p. 8. Archived from the original (PDF) on September 13, 2011. Retrieved April 18, 2011. ↑ Alyssa Smith (October 7, 2010). "State Building Challenges in Timor Leste". Columbia Communique. Archived from the original on August 13, 2011. Retrieved April 18, 2011. ↑ Kerry Brown (December 12, 2010). "Lee Huan obituary". The Guardian. UK. Retrieved April 18, 2010. ↑ Herb Jackson. "From Estonia to Leonia". Estonian Office of the President. Archived from the original on May 14, 2011. Retrieved April 18, 2011. ↑ "Columbia 250: Wellington Koo". Columbia University. Retrieved April 18, 2011. ↑ "Benjamin Mkapa". Encyclopedia.com. Retrieved April 18, 2011. ↑ "Profile: Mikhail Saakashvili". BBC News Online. January 25, 2004. Retrieved April 18, 2011. ↑ "Historical Note on Afghanistan" (PDF). United Nations. p. 15. Archived from the original (PDF) on July 23, 2011. Retrieved April 11, 2011. ↑ "Biography of Salim Ahmed Salim". United Nations. Retrieved April 18, 2011. 1 2 "U.S. Students yesterday, world leaders tomorrow". U.S. Department of Education. Archived from the original on November 25, 2005. Retrieved April 11, 2011. ↑ Reilly, Taylor (1997). Science and Football III. Taylor and Francis. p. 348. ISBN 0-419-22160-3. ↑ Gerth, Karl (2004). China made: Consumer Culture and the creation of the nation. Harvard University. p. 224. ISBN 0-674-01654-8. ↑ "Charlemagne: Wlodzimierz Cimoszewicz". The Economist. November 1, 2001. Retrieved June 17, 2011. ↑ Reilly, Thomas (1997). Science and Football III. Taylor & Francis. pp. 46–47. ISBN 0-419-22160-3. ↑ "Education: Prince with a Purpose". Time Magazine. January 1, 1945. Retrieved June 17, 2011. ↑ "Juan Bautista Sacasa". Encyclopædia Britannica. Retrieved June 17, 2011. ↑ "T. V. Soong (Song Ziwen) – A Prominent Businessman and Politician in Republic of China". Cultural China. Archived from the original on October 5, 2011. Retrieved June 17, 2011. ↑ "Alumnus, Author of Indian Constitution Honored". ↑ "Letters To The Editor; The Interesting Career Of John Jacob Astor Ii. A Man Of Broad And Generous Sympathies Who Appreciated The Responsibilities Of Wealth". The New York Times. August 24, 1890. Retrieved April 14, 2011. ↑ Reynolds, Cuyler (1914). Genealogical and family history of southern New York and the Hudson River Valley. Lewis Historical Pub. Co. p. 1263. Retrieved April 16, 2011. ↑ "World's Billionaires: Warren Buffett". Forbes Magazine. March 1, 2011. Retrieved April 12, 2011. ↑ Murray, Michael (1999). Encyclopedia of Television News. Greenwood Publishing. ISBN 1-57356-108-8. ↑ Serwer, Andy (November 15, 2004). "The Waltons: Inside America's Richest Family". Fortune. Retrieved April 12, 2011. ↑ "Bain to Manage Harvard Endowment's $3.4 Billion of Real Estate". Bloomberg.com. 2017-12-15. Retrieved 2018-01-26. ↑ "Columbia College awards highest honor to Jonathan S. Lavine, CC '88 - Columbia Daily Spectator". www.columbiaspectator.com. Retrieved 2018-01-26. ↑ The Age (2009). Melbourne-raised Gorman new chief of Morgan Stanley. Retrieved September 13, 2009. ↑ "Robert J. Stevens". Lockheed Martin. Archived from the original on May 3, 2011. Retrieved April 16, 2011. ↑ "Business Profile: Philippe P. Dauman". Bloomberg Business. Retrieved April 16, 2011. ↑ "Xerox's next CEO: Ursula Burns". Fortune Magazine. May 22, 2009. Retrieved April 16, 2011. ↑ "Office of the Secretary of The University". Columbia University. Archived from the original on October 29, 2010. Retrieved April 15, 2011. ↑ Sicherman, Barbara; Green, Carol Hurd (1993). Notable American women : the modern period ; a biographical dictionary (6th pring. ed.). Cambridge, Mass [u.a. ]: Belknap Press of Harvard Univ. Press. p. 453. ISBN 978-0-674-62733-8. Retrieved March 17, 2015. ↑ "Herman Hollerith". IBM. Retrieved April 11, 2011. ↑ Tsividis, Yannis (Spring 2002). "Edwin Armstrong: Pioneer of the Airwaves". Columbia Alumni Magazine. Retrieved April 15, 2011. ↑ Allen, Thomas (2007). Rickover: Father of the Nuclear Navy. Brassey's. p. 12. ISBN 1-57488-704-1. ↑ Richmond Ezer Escolar (June 11, 2008). "Google Conquers China: An Interview with Kai-Fu Lee". Columbia Business School Chazen Web Journal. Archived from the original on April 4, 2012. Retrieved April 12, 2012. ↑ Green, Michelle (1986). "Stephen Jay Gould: driven by a hunger to learn and to write". People 25 (June 2): 109-114. ↑ David Goodstein. "In the Case of Robert Andrews Millikan" (PDF). American Scientist: 54–60. ↑ "Michael Pupin". Columbia University: Department of Physics. Archived from the original on January 9, 2011. Retrieved April 16, 2011. ↑ "William Barclay Parsons". Columbia University. Retrieved April 16, 2011. ↑ "Irwin Edman". Columbia University. Retrieved April 16, 2011. ↑ Ryan, Alan (January 30, 2001). "Obituary: Professor Robert Nozick". The Independent. London. Retrieved April 16, 2011. ↑ "Columbia University 250: Milton Friedman". Retrieved April 16, 2011. ↑ Ogilvie, Marilyn; Harvey, Joy, eds. (2000). The biographical dictionary of women in science : pioneering lives from ancient times to the mid-20th century. New York, NY [u.a. ]: Routledge. p. 65. ISBN 0-415-92039-6. ↑ Saxon, Wolfgang. "Rose L. Coser, 78; Taught Sociology At Stony Brook". The New York Times. ↑ Vromen, Suzanne. "Rose Laub Coser". Jewish Women's Archive. ↑ Hischak, Thomas (2007). The Rodgers and Hammerstein Encyclopedia. Westport, CT: Greenwood Publishing. p. 9. ISBN 0-313-34140-0. ↑ Herman, Jan (February 6, 1977). "TV Makes You Famous; Rock 'n Roll Makes You Rich". Gannett News Service. ↑ Literature Resource Center: "The Beat Generation". Retrieved November 13, 2013. ↑ "Columbia University 250: Langston Hughes". Columbia University. Retrieved April 17, 2011. ↑ "Columbia University 250: Isaac Asimov". Columbia University. Retrieved April 17, 2011. ↑ Alexander, Paul (1999). Salinger: A Biography. Los Angeles: Renaissance. ISBN 1-58063-080-4. ↑ Encyclopædia Britannica: "Upton Sinclair". Retrieved April 15, 2011. ↑ "Award winning writer Danielle Evans featured in Southeastern's 'Common Read' program". Southeastern Louisiana University. Retrieved March 23, 2017. ↑ Thompson, Hunter (1998). Douglas Brinkley, ed. The Proud Highway: Saga of a Desperate Southern Gentleman (1st ed.). Ballantine Books. p. 139. ISBN 0-345-37796-6. ↑ "Film Obituaries; Sidney Lumet". The Daily Telegraph. London. April 9, 2011. Retrieved April 16, 2011. ↑ "School of the Arts Alumna Kathryn Bigelow Wins Major British Film Award". Columbia University. February 22, 2010. Archived from the original on July 24, 2011. Retrieved April 16, 2011. ↑ Gussow, Mel (August 18, 1995). "Howard Koch, a Screenwriter For 'Casablanca,' Dies at 93". The New York Times. Retrieved April 11, 2011. ↑ Flint, Peter (February 6, 1993). "Joseph L. Mankiewicz, Literate Skeptic of the Cinema, Dies at 83". The New York Times. Retrieved April 11, 2011. ↑ Flint, Peter (March 31, 1986). "James Cagney Is Dead at 86; Master of Pugnacious Grace". The New York Times. Retrieved April 14, 2011. ↑ "Ed Harris: Full Biography". The New York Times. Retrieved April 17, 2011. Wikimedia Commons has media related to Columbia University. "Columbia University". Encyclopædia Britannica. 6 (11th ed.). 1911. "Columbia University". New International Encyclopedia. 1905.